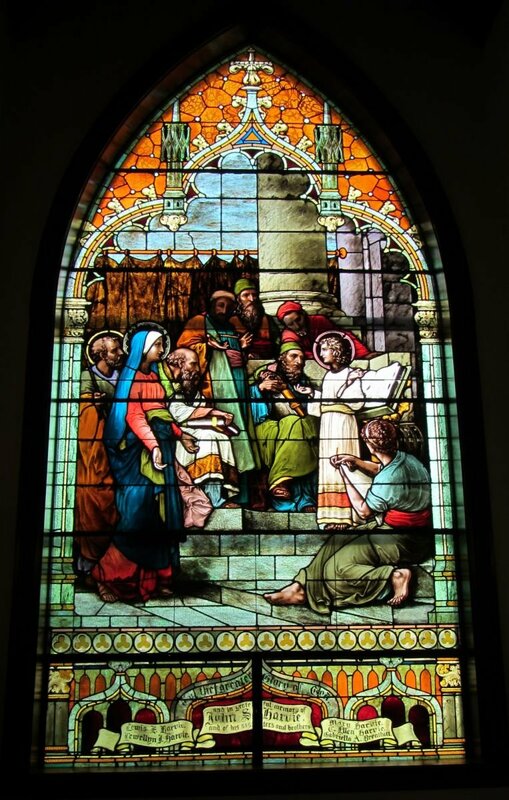 First, a note about WEDDINGS: Currently, the only weddings allowed to be performed at Ascension (either in the church, or anywhere on the grounds) are those where at least one of the parties is a member or regular attendee of Ascension or another Episcopal parish. The couple must complete a course of counseling with the officiant prior to the wedding. The following areas may be available for rental by Ascension parishioners and outside groups or individuals, with preference and precedence always given to church events. To inquire about holding your event at Ascension, contact the Parish Administrator at 502-223-0557, or email info@ascensionfrankfort.org. This sacred space is only available for specific, pre-approved events, such as religious services, choral performances, solemn investiture ceremonies. There is generally no fee if the use is for a local educational or non-profit group. Our historic and beautifully appointed Parish Hall holds up to 10 round tables seating 8-10 people each. In addition, there are two long serving tables, and two small seating areas with a sofa and chairs. There is a small "stage" area under the large stained-glass window pictured here, and two doors facing Washington Street. The space may be rented for meetings, receptions and parties by Ascension parishioners, local organizations and non-profit groups, and even private individuals. A speaker stand with microphone and a portable display screen are available. Any projection equipment must be provided by the user. The full commercial kitchen features back-door access via Catfish Alley, and a long counter for walk-through food service. An ice machine ensures that ice is always readily available. The kitchen will NOT be rented out for commercial purposes. Catering Services: Only persons, groups and/or vendors approved by the Church of the Ascension shall use the kitchen appliances and/or provide catering services. Church staff may provide references for vendors upon request. Our library/conference room is more comfortable than the larger parish hall for small group meetings. Four wooden conference tables may be arranged to suit; about 20 people may be accommodated comfortably. "Church events" shall include all activities directly related to Church of the Ascension such as services, funerals, and other activities for Ascension-sponsored groups and parishioners, and will be given preference/precedence in scheduling. "Other events" include all activities not sponsored by Church of the Ascension, as recognized by the Rector. These may include, but are not limited to, fundraisers, social events, club functions, educational events, conferences, dinners, private parties, etc. "Prohibited Events" include, but are not limited to, political gatherings or speeches, demonstrations, protests, press conferences, any action that promotes hate or discrimination, any permanent or semi-permanent business setup, and other activities which are not constructive for the Church as determined by the Rector. The Rector shall make the final determination of the nature and charges for events at Church of the Ascension; the Rector is the final authority to approve or disapprove any event on church property. The dispensing and consumption of alcoholic beverages is strictly limited to the parish hall and library areas. Types of alcoholic beverages allowed are limited to wine, beer, and wine/champagne punches. Use of distilled spirits (e.g., whiskey, rum, vodka, gin, etc.) is prohibited. If alcoholic punch is dispensed, a non-alcohol drink with similar presentation (e.g., a punch) must also be offered. The laws and statutes of the Commonwealth of Kentucky apply to all use of alcohol. The dispensing to or consumption of alcoholic drinks by minors is strictly prohibited. Also unacceptable is any sign of intoxication. Persons consuming alcohol to a degree beyond the lawful limits to operate motor vehicles SHALL NOT be allowed to drive. Failure to abide by this agreement or the laws of the Commonwealth of Kentucky shall result in an event termination and/or police action. Church of the Ascension is a non-smoking facility. Smoking is permitted outdoors.